Top Floor condo with water views of the bay. In the heart of Dewey at 118 Bellevue St. Beautifully decorated condo, for your family or friends to enjoy. This condo is equipped with everything you will need to enjoy your vacation. Parking for 3 cars underneath. Park and walk to everything in Dewey, or catch the trolley to Rehoboth Beach. Outdoor shower is great for washing sand off. Sit on the balcony and relax! 2 Full Bathrooms Please bring your own towels. The condo was quaint and clean. Exactly what we were looking for and it was quiet, couldn’t ask for more! But of course on top of that, Diane and Robin were wonderful and very responsive. We will be back! 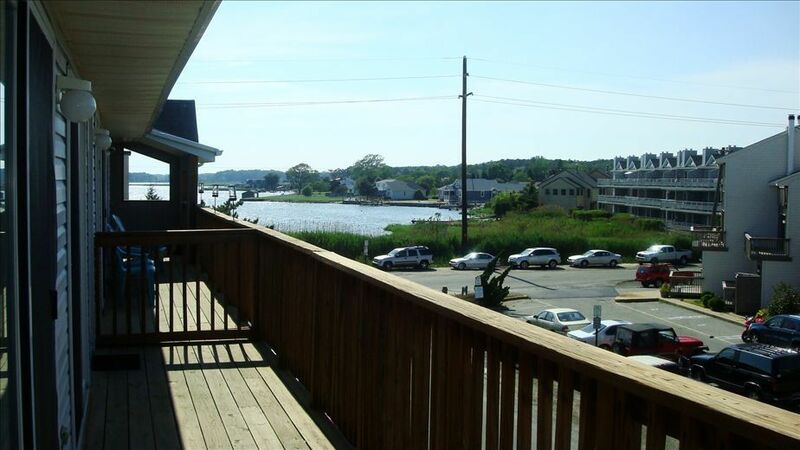 Property is right in the middle of Dewey Beach so you can walk to the beach, restaurants, bars, and shopping. You can also catch the Jolly Trolley to Rehoboth Beach/boardwalk as well. We brought our dogs with us too, which was one of the other reasons we chose this property. We went during the week for 4 days and the rental rate was so affordable! The beach licenses for the dogs was only $5/dog for 3 days from the kiosk at Town Hall. There are a lot of great restaurants in very short walking distance (we parked in the condo designated parking and did not need to drive anywhere until checked out)! The condo itself was clean. It has two queen size beds-one of the bedrooms has a TV and it’s own bathroom. The third bedroom has two twin beds. There is a pull out sofa bed in the living room. The second bathroom was in the hallway. There was a well-stocked kitchen which was clean. We appreciated the automatic ice maker in the freezer so we had lots of ice waiting for us when we arrived. The only games we saw were Scrabble and playing cards. The deck is huge and had a few chairs. Beautiful sunset views of Rehoboth Bay from the balcony. The dining room table had 6 chairs. We liked that on the side of the house there is an outdoor shower to rinse the sand off and rinse your beach chairs etc. before getting sand in the house or car. The booking of the rental was easy and efficient. The owners were fantastic with communication and very easy to deal with. Some of the furnishings and decor were outdated but we didn’t care. It was very comfortable for us and the dogs. During the regular season dogs are allowed on the beach before 9:30am and after 5:30pm, or any time in the off-season (check dates). There are a few dog-friendly restaurants too. We arrived on Labor Day and a few places shut down for the season but there were most still open. There was so much space on the beach since kids went back to school. The condo was also quiet at night and the beds were comfortable. We loved our whole short vacation. Thanks so much Diane and Robin! Highly recommend! We had a great time. The apartment was right on the bay side and in walking distance to everything... Walking distance to the beach, bars, food..you name it. Plenty of space to sleep and be comfortable. We had the best girls weekend at this condo in Dewey! The location was the absolute best and the big balcony was a plus. Bedroom and bathroom accommodations worked for our large group. The owner was very helpful and responsive so we will be back, I’m sure!